This is a one-year old male, castrated domestic short-hair cat. He's here for dental therapy today. As you can see he has a little gingivitis and tartar accumulation. We just did the blood work and we're ready to put him under anesthesia to do dental therapy. He's getting oxygenated to get ready for the anesthesia. He is under anesthesia right now and his vitals are monitored very closely with this machine. EKG, Pulse Ox; which is the oxygenation level, the capnography; which checks for the CO2 level, are all checked on this machine. We’re about to start the cleaning and we will be constantly monitoring anesthesia. We then take four dental x-rays. After a thorough cleaning by the nurse we assess the periodontal space with a periodontal probe. This cat’s periodontal space looked healthy so we did not have to do any further treatment for the periodontal space. Now we're going to look at the x-rays to assess the remaining oral health. Now we're going to assess his radiographs to make sure everything's okay. The crown of cats and dogs is a case of about 40% of the teeth that you could see and 60% is under the bone so x-rays are very helpful to look at the entire health of the teeth and his x-rays look really nice. 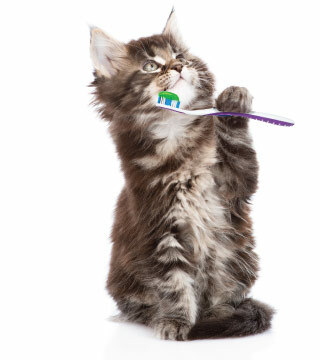 Now we're going to apply SANOS, which is a gingival dental sealant for dogs and cats that seals the gingival sulcus; which is the space between the gum and the teeth, against the formation of plaque. It works for six months and we highly recommend it but this is an optional treatment.